Anamorphic: N/A; appears in its original 1.33:1 format. My Advice: Interested parties should at least rent. Wagner�s Ring Cycle, consisting of four separate operas for a grand total of about fourteen to seventeen hours (depending on who you ask) of diva-drama, is by far the most ambitious production an opera company could mount. With a separate cast for each of the four operas, plus dancers, supernumerary characters, huge sets, tons of costumes, props�well, it�s quite a lot to organize. So while Brunhilde is singing away onstage, what�s happening backstage? For anyone who has ever wondered what goes on behind the scenes during a theatrical performance, this documentary is a must-see. Sing Faster is an incredibly accurate (albeit necessarily and thankfully edited) representation of the multitudes of backstage folks that make it all happen. 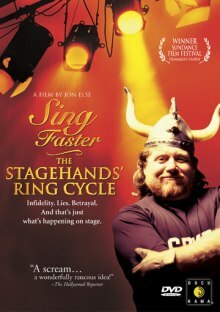 The documentary profiles real IASTE stagehands and other backstage crew members during a production of the Ring Cycle in San Francisco in 1999 at one month before opening night, two weeks before, and on opening night itself. 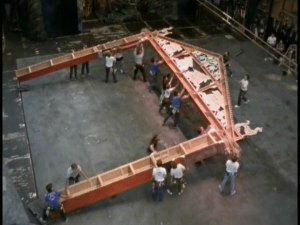 The sight of stagehands maneuvering set pieces around between scenes is as much a choreographed bit as anything that an audience will see onstage. This choreography is complicated enough that the crew rehearsed this production for about a month after everything was built and done to get ready for opening night. They have a set time (dictated by the orchestration) to get the set moved and replaced, and if they don�t make it, well, the audience will either be sitting there waiting, staring at a curtain with no music, or the curtain will go up with stagehands still scrambling to get pieces in place. And these are not your standard community theatre sets, either. Think thousand-pound multi-story-high building pieces or rocks that take twenty guys to move. Think a dragon that is operated by four guys pushing the body around on a dolly while a stage manager tells them which way to go, while another guy is inside the head of the beast making its mouth move while receiving instructions from yet another stage manager through a headset. This is not for amateurs. Oh, and while they�re not moving scenery, what are all of these guys doing? 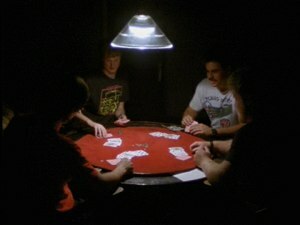 Playing cards, watching TV, balancing their checkbooks� you name it--they often have large breaks when the singers are singing to kick back and relax a bit. When it�s time to go, though, these guys hustle, laden down with their tool belts to get the job done. And lest you think that the stagehands are doing all of the work, director Else also profiles many of the other people backstage putting it all together, such as the tireless stage managers and other crew members working just as hard (and during those card games downstairs, even harder) as the stagehands. The documentary is put together beautifully. Many scenes with the stagehands moving set pieces and getting things ready are backed by music from the opera, and while the singers are onstage, a stagehand�s synopsis of the plot is narrated over the action. Interspersed with this are the many bits during rehearsals when different stage managers are calling out commands to the crew and everyone is just doing their thing. Else does a good job of showing the pitfalls that go along with rehearsals as well as the moments when everything goes smoothly. Also, one of the most impressive things that he did was to capture time-elapsed run-throughs of all of the set changes and of the opera itself. It�s just amazing to look at all of that work going by so fast. While the documentary itself is wonderful, the DVD is certainly lacking in features. With all of this information given out so quickly (the documentary is only fifty-six minutes long), it would be nice to have some sort of explanation for all of the things going on that are not mentioned directly in the film. Why are there monitors backstage with the conductor on them (to provide musical cues for performers and stage managers)? What is a Super Giant (a supernumerary character is an opera character who does not sing�for short, they�re called Supers, and these non-singing guys are playing giants)? It would have been nice to have at least some kind of glossary or FAQ as a text feature to supplement the layman�s viewing of the film. Sing Faster will give you a hint of what life behind the scenes of any opera is like. Take away the fact that there are four operas happening, and it is frightening (as someone who has worked backstage in opera) to see how accurate Else has made his representation. It is clear to see why this film won the Filmmaker�s Trophy at the Sundance Film Festival. If you love opera, if you�ve ever wondered what goes on backstage in a professional theatre, or if you�ve worked backstage and want to see how the heck someone puts together the formidable Ring Cycle, please, please pick up this disc. Despite its lack of features, it is truly an educational experience.